Lisa McHale, wife and widow of former Tampa Bay lineman Tom McHale spoke to WTSP-10 reporter Noah Pransky about her husband, their children and CTE. “The hardest day of my life was having tell them that Tom . . . daddy was gone and he wasn’t coming back.” 45 year-old Cornell graduate and 8 year NFL pro McHale died from an accidental drug overdose after a brief post-career struggle with pain pill addiction, injuries, depression and anger. 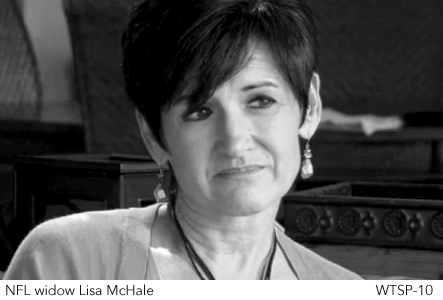 After his death, Lisa McHale donated her husband’s brain to researchers at Boston University where massive evidence of damage was then discovered in McHale’s brain.